It may be the middle of November, but I am still collecting the most succulent raspberries in the veg garden. Today’s harvest was mostly used in a Chocolate Truffle Gateau (I’ll be posting the recipe soon). I love the all the yellow and orange colours in the garden at this time of year, but as I drive in the gate at Hunters Lodge, the first colour I see is the bright pink of our surplus stall shelves. Bare at the time of the year and waiting to be housed indoors for the winter, they remind me of the abundance of produce we enjoy during the warm summer months. “It’s great to see our little surplus stall at the gate doing so well. 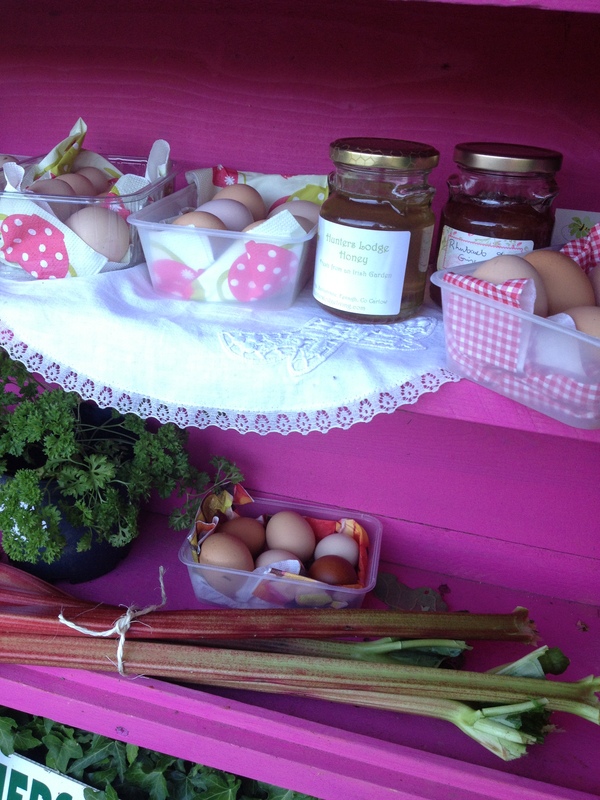 Eggs, rhubarb, broadbeans, raspberries – all freshly picked and there for the taking. We recently added honey, much to the delight of our neighbours. Each morning our little dog Pippi waits patiently for me to pick up my basket of goodies for the gate so that she can race me down to that gate. Believe me, she has no competition and every day she wins. That’s just what we do. I leave the goodies beside the honesty box and off I go about my business. People arrive, take what they want and put money in the box. Not ONCE has payment not been left. Not ONCE has produce been stolen.